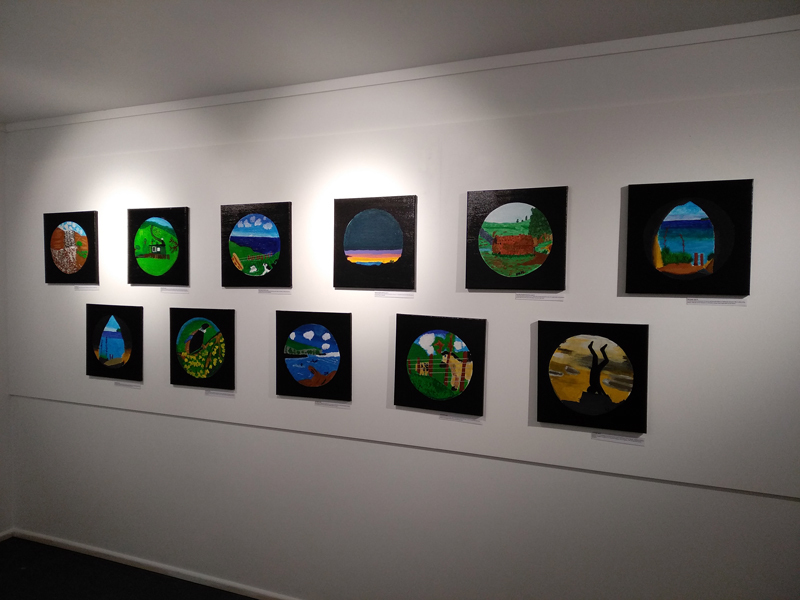 This exhibition celebrates the cluster group of local schools of Whareorino, Mokau, Home School and Ahititi. This group holds various events together and meets regularly. Rural schools can be very isolated at times so clusters such as this are a great support system. With this in mind the theme for this joint exhibition is “Working Together”. 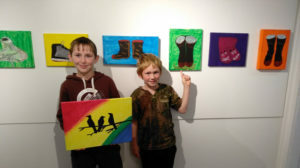 Joshua and Ryan Evans proudly show their artwork. Joshua is with the Home School group while Ryan is with Ahititi School. Ahititi School’s interpretation of the theme turned to discussing having the right shoes for the right job. They photographed their footwear and used acrylics and pastel to paint these working from their photographs. Ten students, ranging from the age of five through to 13, all produced a wonderfully colourful version of their shoes, boots and slippers! 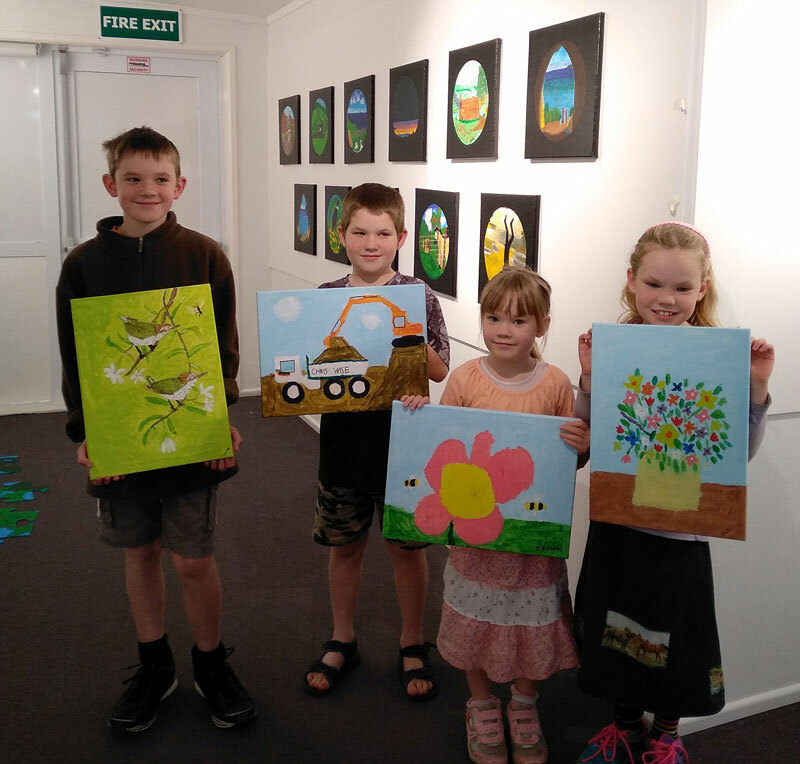 Mokau School was inspired by their Seeds and Plants study and the exhibition theme of “working together” fitted in perfectly as plants are an important part of a healthy ecosystem and have been used for centuries to assist people in their daily lives. Mokau is fortunate to be surrounded by many beautiful plants that are native to Aotearoa New Zealand. The versatility, significance and prevalence of three specific plants in Mokau provided the inspiration for this artwork. 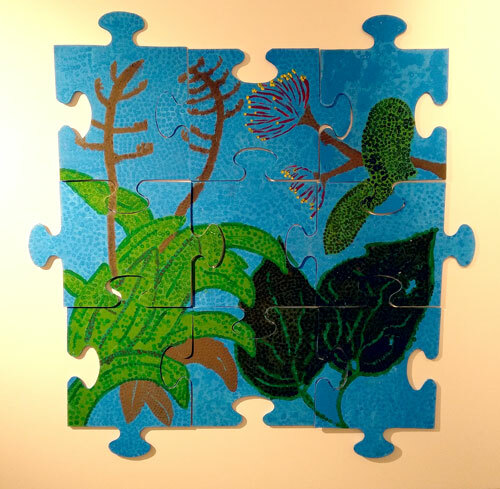 The Harakeke, Kawakawa and Pohutukawa jigsaw has been painted collaboratively by our students using a pointillism technique. They are year 1, 2, 3 and 5 so we hope you appreciate and enjoy their efforts. Harakeke has always been highly regarded and harvested by Māori as a plant from which essential technologies have developed and continue to be in use today. It has medicinal properties and the flax fibre was a popular trade item for rope and linen. Kawakawa was traditionally used as a herbal remedy to treat a wide variety of body aches, inflammation and pain. It is also a refreshing, rejuvenating and uplifting tonic to improve energy and stamina. Pohutukawa is a strong and durable plant that continues to protect and stabilise our coastlines. The nectar from the flowers was collected by Māori and used in the treatment of sore throats. Both Māori and Europeans used the inner bark in the treatment of diarrhoea and dysentery. The wood was used by Māori for a variety of tools and it also served as a timber tree for Europeans. It was prized as a fine source of firewood producing a strong hot flame and was used extensively by European ship builders for its natural bends and immunity to sea worms. The students of Whareorino School appreciate that they live in a very special part Aotearoa that most other people never get to access. 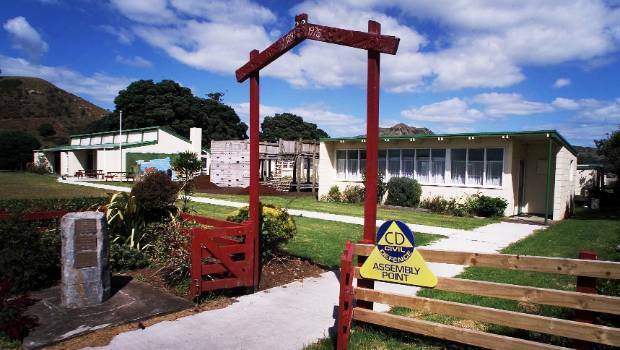 They love being country kids, growing up in Waikawau near beautiful, rugged beaches and surrounded by rolling hills. 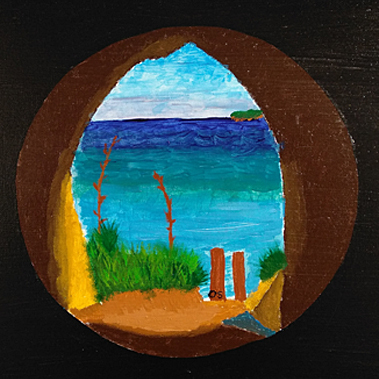 Their art gives you a sneak peek into their backyards and places that are special to them. Look through the lens of a child and see our special little piece of paradise that we are lucky enough to call home! 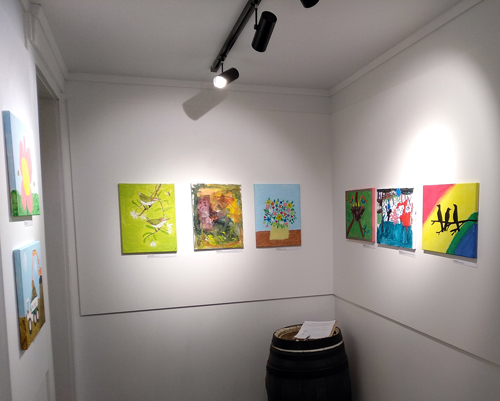 Some of the Lowry children brought their paintings in so we were able to capture the artist with their artwork as we were installing the exhibition. 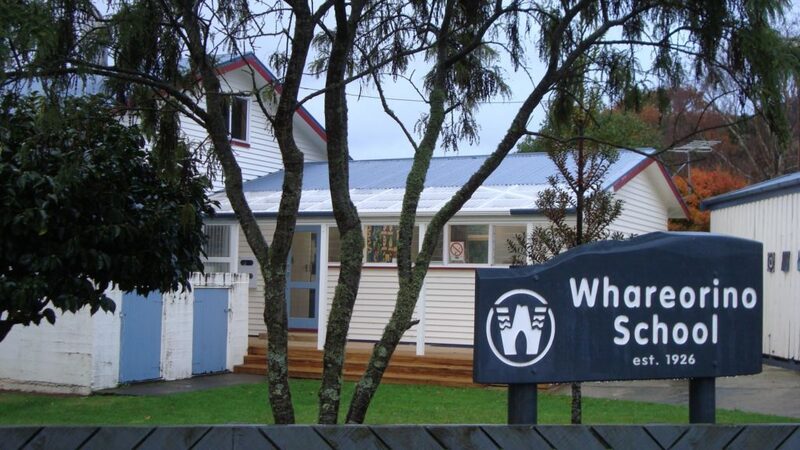 Whareorino School’s paintings can be seen on the wall behind them. Home education in the Tainui Area. In the Tainui area we have a few families that home educate. There are a number of reasons for educating at home, its a big decision but usually the parents undertake the challenge willingly believing it’s the best option for their children. The benefits include being able to cater more to each individual child’s needs and incorporate the beliefs and culture of the parents into their children’s education. There many curriculums and resources that are available. Some people use a packaged curriculum, while others make up their own, or compile their curriculum from different resources. In the Tainui area we are privileged to be able to join with the local schools for combined events such as cross country, athletics, and now this art exhibition. There is a large homeschool group in New Plymouth that organizes trips, sports, competitions, and other social events, giving the homeschool children variety concerning socialization and extra curricular activities.